The Place I’ve walked into InterContinental Singapore countless times but have never realised that there is an Afternoon Tea session at its lobby. With a beautiful and open concept setting, I checked out The Lobby Lounge for its new Spring-inspired Heritage Afternoon Tea: Au Jardin recently. I like the high ceiling of The Lobby Lounge, the plush and comfy sofa as well as the soothing ambience from the melodious live pianist performance. The Food The Heritage Afternoon Tea: Au Jardin is available at The Lobby Lounge until 31 July 2017 from 2pm to 5pm daily, specially curated by Pastry Chef Ben Goh. 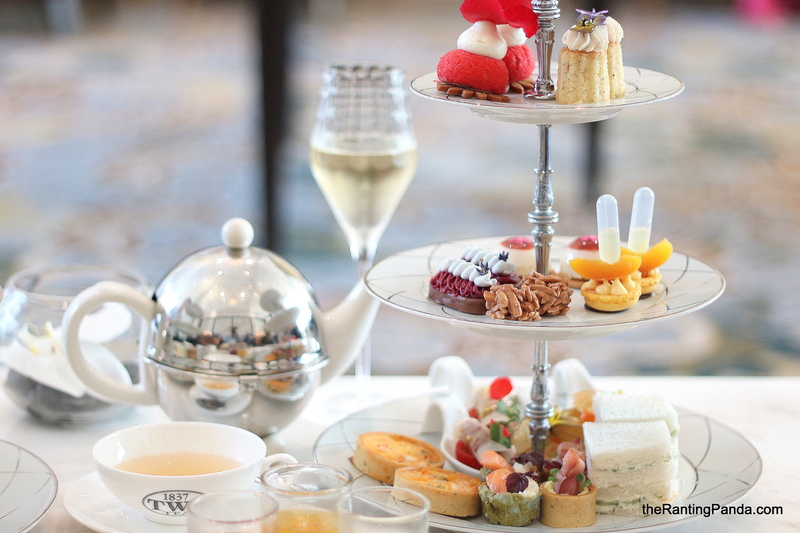 The three-tiered set is priced at S$78++ for two guests, inclusive of a choice of loose-leaf teas or coffee, or S$108++ for two guests, inclusive of a choice of loose-leaf tea or coffee and two flutes of Perrier-Jouët Grand Brut Champagne. Starting from the savoury selections at the bottom tier, I enjoyed the Baked Salmon with Ginger Flower & Dill Cream and the Ratatouille-Thyme Flower Quiche. Both bites, though small, were filled with fresh and strong notes which made me crave for more. Other savoury selections include the likes of Cucumber, Cream Cheese & Osmanthus on White Bread, Duck Rillettes, Pickled Lotus Root & Chrysanthemum and Honey Ham, Egg Mayonnaise & Grape Tartlet. The scones were also very good. There are two unique flavours to choose from, Jasmine Scones and Lemon Scones, served with Strawberry Jam, Violette-Orange Marmalade and Clotted Cream. The scones had a nice buttery flavour which was just right, complete with hints of floral notes consistent with the Spring edition. Of course, any good Afternoon Tea is not complete with some sweet treats. I do not have a very sweet tooth, but found myself taking bits of the sweets uncontrollably. The presentation of each item itself is very exquisite, a visual treat which I find lacking in most Afternoon Teas in Singapore. Of the sweets selections, I enjoyed the Lavender-Blackcurrant Tarte, another unique creation by Chef Ben which hit the right notes with its on point texture and combination. The Strawberry-Sakura Surprise was indeed a surprise as I did sense hints of sakura, an element which is easy to have on the menu but challenging to put into practice. Chef Ben uses Sakura petals from Japan to create this interesting dessert. Other sweet treats to expect include the Apricot-Osmanthus-Goji Macaron, Orange Blossom Financier with Orange Confit & Cinnamon Chantilly and Crêpes with Berry Compote & Hibiscus-Peach Sherbet. Rants Not the most peaceful of hotel lounges, but InterContinental compensates it with the live music and a spacious setup between tables. Will I Return Again? With a afternoon tea set that is expected to change seasonally, we are excited to savour what Chef Ben has to offer next. Make your reservation instantly at The Lobby Lounge here.